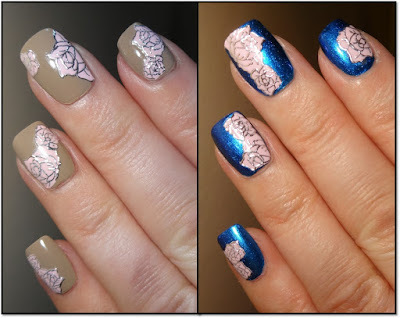 A couple of manis to show you using pink with silver edged 3D Nail Stickers from Lady Queen. The delicate pale pink rose flowers are edged in silver and there's a generous amount for several manis or accent nails. I've used them over a neutral & blue shimmer base and I think they'll look great over lots of different colours. They come on a clear backing sheet which is really handy because you can hold the decal over your nail to see how it will look before applying. Simply peel the decal from the backing sheet, press onto your nail and seal with top coat. The pink with silver edged 3D Nail Stickers are available in 12 different floral designs. Check out my video demonstration below. The pink with silver edged 3D Nail Stickers currently cost $2.82/ £1.81 / €2.31. You can also use my 15% discount code AELC15 which gets you 15% off full priced items! Check out the Lady Queen website for loads of cool nail art goodies and take a look at the FLASH SALE tab for great bargains!